Holiday cheers to you! Last week, my husband and I were invited to a small cocktail party in our neighborhood. Tacky Christmas attire (give it up for crazy Christmas sweaters!) was encouraged. I didn't have any crazy Christmas sweaters, but decided to whip up a kooky little headband to wear instead. It came together so easily, I didn't even think to take step-by-step pictures, but I'll share how I made it below. I was tweeting the progress, so all I've got are some quickie iPhone & Photo Booth pics, but you'll get the idea. It took literally maybe 15 minutes from start to finish, and was a big hit at the party. I may have gone a little overboard and also fashioned a matching ring and set of gift wrap bow brooches to complete the accessory set as well ... What can I say? 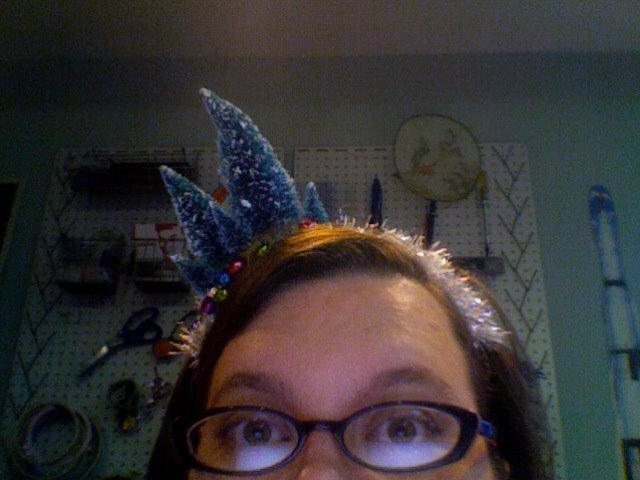 I hadn't played with a glue gun in a while, and I forgot how easily and quickly hot glue projects come together. 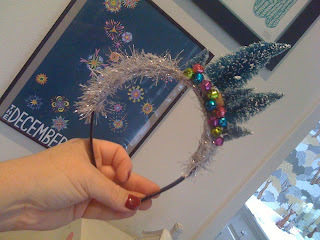 - Decide how you want to arrange your trees on the headband before you start gluing. Add a dollop of hot glue to the base of each tree and stick 'em on the headband. I ended up putting glue on the bottom and back side of a small tree or two to "nestle" them into the bigger trees. - Use small dollops of hot glue to secure the jingle bells across the front to hide the massive amounts of hot glue used to add the trees. You're done! 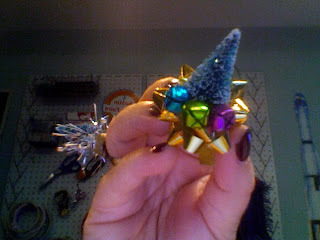 - Use the tacky glue to add sequin "ornaments" to the tree. - I wanted to come up with a gift bow brooch, but didn't have any blanks to use. I spied a little bowl of 1" buttons I'd collected at various events over the years and a light went off in my head. I grabbed a few and just hot glued the bows to the button fronts. - I also put a bunch of hot glue on the back of a tree and smooshed it into one of the gift bows and then glued a few jingle bells on to the front. 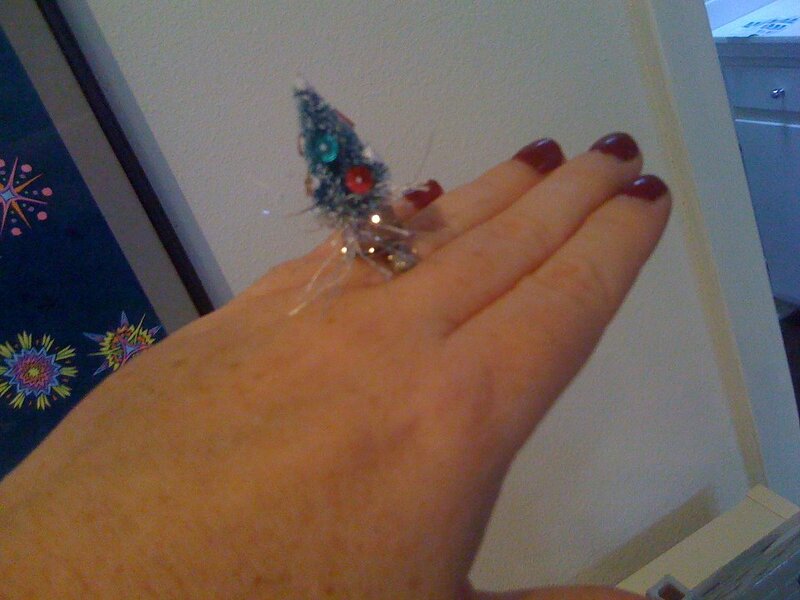 I pinned them on to my dress in a group and made a festive little bow "corsage." And, because you stuck with me through all the poorly-lit/focused pictures: an action shot! * A word of warning: when gluing the yarn to the headband, be sure you let it dry before you try it on. Hot glue is hard to get out of your hair. Not that I know anything about that. We've been watching the Brian Greene, Fabric of the Cosmos, series on NOVA lately and have been completely fascinated. It's mind-blowing in the best way, and I want to watch episodes over and over again just to soak it all in. If you haven't watched it yet, I highly recommend checking out the PBS web site to watch online. 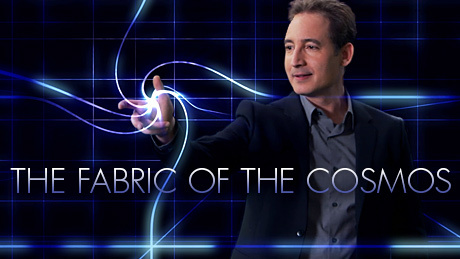 Of course, as he talks about the "Fabric" of the Cosmos, my brain instantly goes to textiles. I have some ideas for bigger, more complex projects on this subject, but was in need of some instant-ish gratification this week and decided to do a simple skirt to scratch the itch. This was one of those projects that comes together so seamlessly (pun intended) that you know it was meant to be. As soon as the idea popped in to my head, I could instantly put my hands on just about every material I'd need for the project and it came together very quickly. 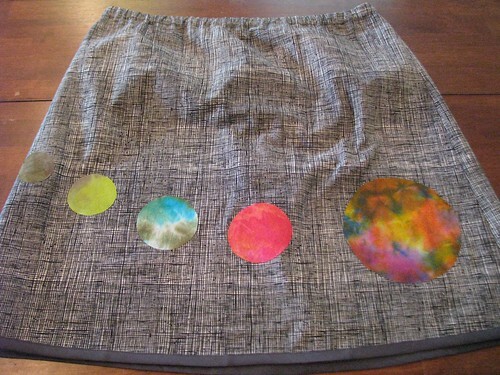 For the base of the skirt, I wanted a fabric that resembles the weave used in the graphics in the Fabric of the Cosmos show. I happened to have this awesome Alexander Henry fabric that I got at the Stitch Lab ages ago that was perfect. It's a yummy, heavy fabric with a great cross-hatch print. 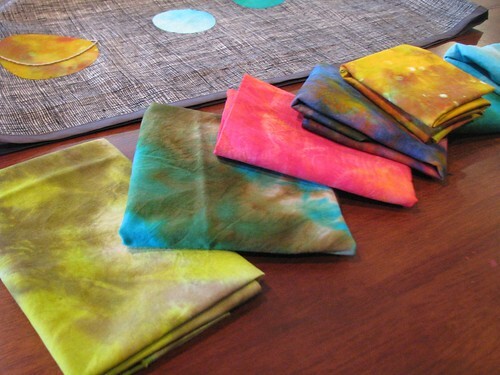 From there, I pulled out my stash of hand-dyed fat quarters that I made in my surface design class with Kat. 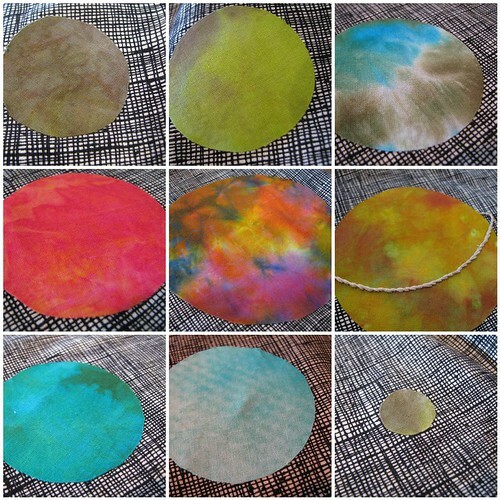 I was able to find pieces that resembled each planet (ok, ok, Jupiter is a tad ... psychedelic, but it works!) and did a quick applique. I embroidered the rings of Saturn, but getting the needle through the heavy fabric and the fusible webbing proved much tougher than I'd anticipated. Instead of stitching many rings, my fingers could only stand to stitch one. 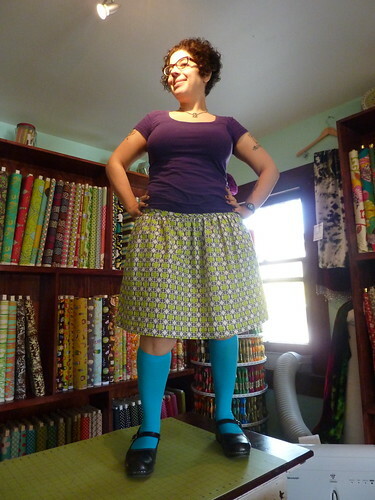 I've lost count of how many of these simple, elastic-waist skirts from my Beginning I sewing class at the Stitch Lab I've made. 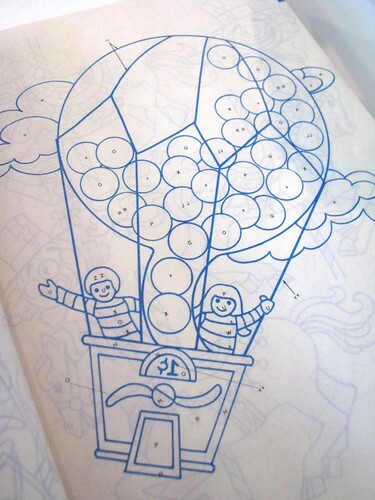 My pattern from the class is starting to show its age, and needs to be re-drawn before I lose it completely. I love how easy it is to create a fun piece of clothing to wear. I may not have the sexiest wardrobe on the planet, but it is fun and personalized. 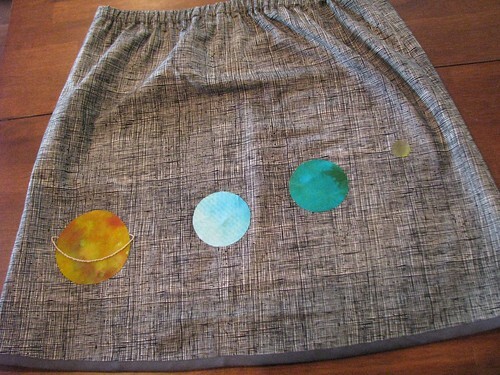 I wear one of these skirts almost every single day, and I'm glad to have this latest geeky one to add to the rotation. Over the years, I've built up a nice stash of vintage craft books and magazines. I have a very hard time resisting them when I find them at garage sales and estate sales. I also have a severe weakness for vintage embroidery, crewel and cross-stitch kits and pieces. I've been meaning to share them here on the blog, and was even more motivated after a visit from Diane and Kristin a couple of weeks ago. Having a great stash of vintage craft magazines is fun and all, but it's fun times ten when you get to sit with some of you best crafty pals and read through them together. Diane already posted about some of the needlework magazines, so I thought I'd share a couple of posts about a particularly awesome book of embroidery transfers I picked up at an estate sale, as well as some other vintage needlework magazines and some of the vintage stationery I've collected as well. 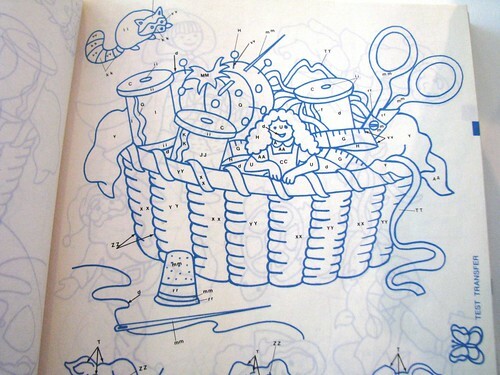 Let's kick it off with the embroidery book, shall we? My daughter actually found this book for me while we were at an estate sale recently. Initially, I almost didn't even thumb through it. 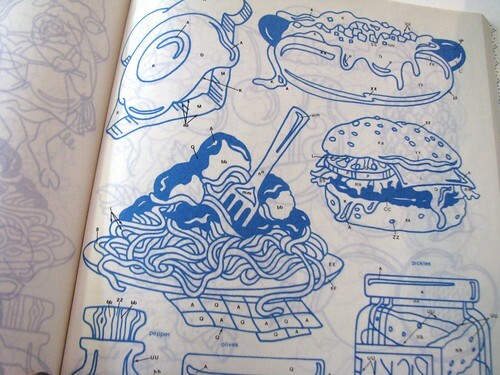 It's a thick book of embroidery transfers, but the cover was a little too country kitchen for my taste, and I figured everything inside would be the same. I'm so glad I decided to actually look through it, because while there is a healthy dose of country geese inside, there are also dozens of kooky and cool designs. 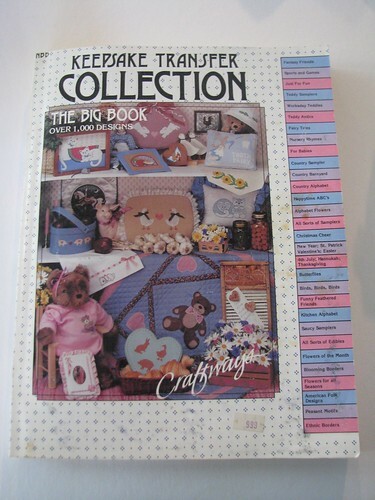 The book is called the Keepsake Transfer Collection and boasts more than 1,000 iron on designs. And they aren't kidding - there are loads of great, unique images in this book - not just repeats of things that are slightly modified. You can find it on Amazon used here. Here are some of my favorites from the book. You can see more over on my Flickr set. There's a whole lot of win on this page. Giraffe on roller skates? Yes, please! I also love the wacky guy who serves as the test transfer. 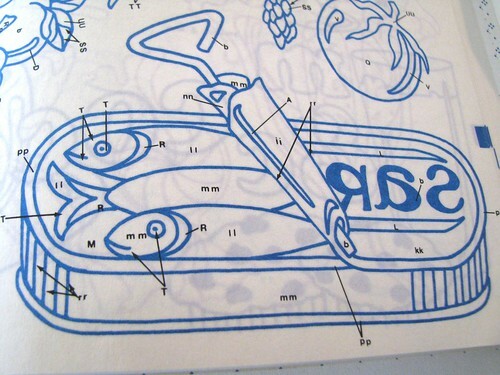 Some designs are highly complex, while others are charmingly simple. I love this little popsicle dude. The book is from the mid-80s (wait, can it still classify as "vintage?") 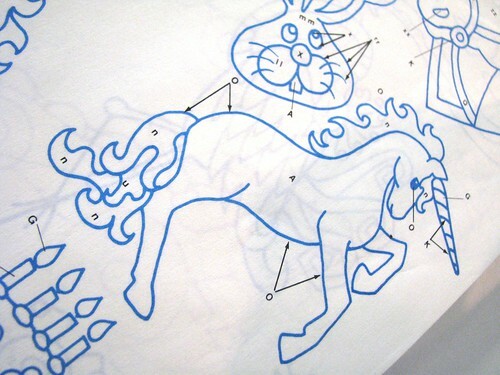 so you know there are unicorns. ... and hot dogs with relish. 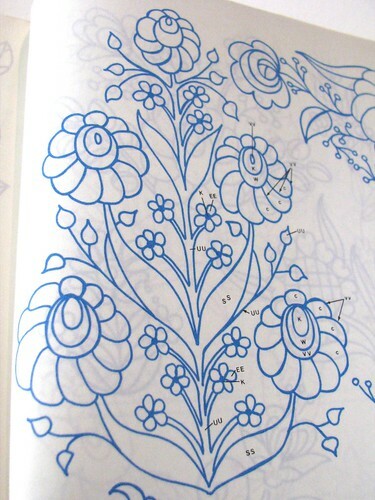 After copious amounts of country kitchen designs, the book wraps up with pages and pages of really lovely floral designs that would be beautiful if worked in crewel or punch needle. I'm so glad my daughter convinced me to look through this book. In the end, I think I got it for less than a dollar, and have found it hugely inspiring and fun to flip through. I haven't tried ironing on any of the designs yet, but I have used my light box to transfer one and use it for punch needle embroidery (something I'll be sharing soon). Go grab a copy off Amazon and enjoy for yourself. You can also see a few more samples of the designs over on my Flickr set. More vintage craft/embroidery finds soon! 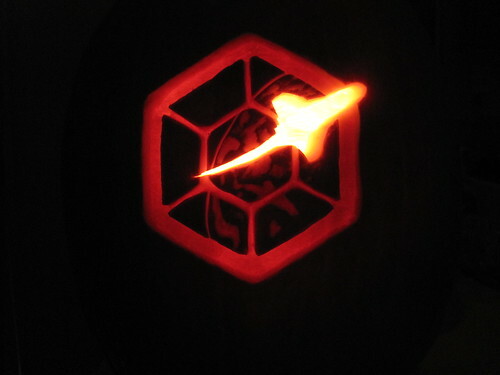 Today is the First Ever World Wide Space-O-Lantern Carving Day! 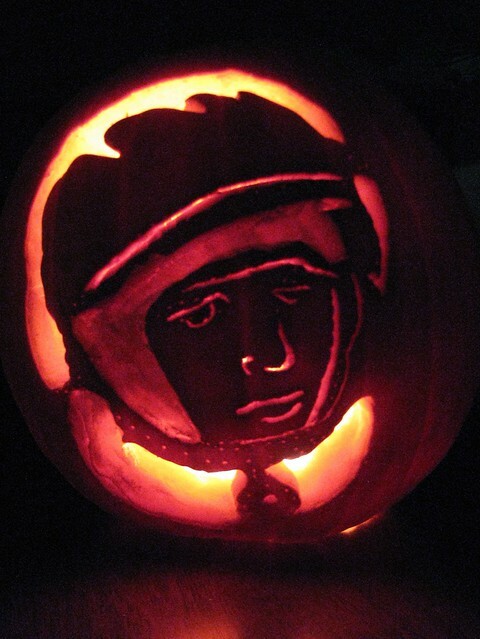 A Yuri Gagarin Space-O-Lantern (I call him, Gagarkin) by me, Rachel Hobson. That's me with the knife and crazed look in my zombie eyes ... Ahhh ... college days. Y'all already know that I'm a massive space geek, but what you might not know about me is that I'm also a huge, HUGE fan of carving pumpkins. Ever since I was a little kid, one of my very favorite parts of Halloween was carving jack-o-lanterns. I was always in charge of scooping out the pumpkin guts, because not only did I not mind manhandling the slimy innards of a pumpkin, I relished it. 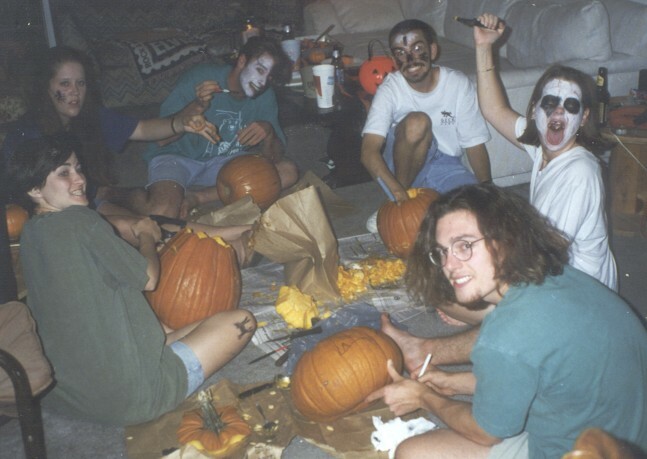 In college, my friends and I would have pumpkin carving parties that were great fun. We'd line our jack-o-lanterns up at the end of the party and get a great picture of them all lit and ready for the front porch. A while back, fellow Space Tweep and brilliant scientist for the International Space Station, Liz Warren (aka - @spasmunkey) posted pictures of the amazing space-o-lanterns she's been carving for ages. Most replicate the patches of various shuttle and ISS missions, and they are all spectacular. She's even posted a time-lapse of a pumpkin-in-process. From the first time I saw them, I joked with Liz that we needed to host a Space-O-Lantern carving party where we could get our space geek friends together and carve pumpkins with space-y images. Last week, we did just that. A small group of Space Tweep friends came over to my house and we spread out in the studio and carved the geekiest, most awesome space-o-lanterns you could ever hope to see. It was a total blast. At the end of the party, we lined the space-o-lanterns up outside and photographed them like we were nerdy paparazzi. We then rolled the telescope out on to the back deck and looked at the moons and stripes of Jupiter. It. Was. Awesome. 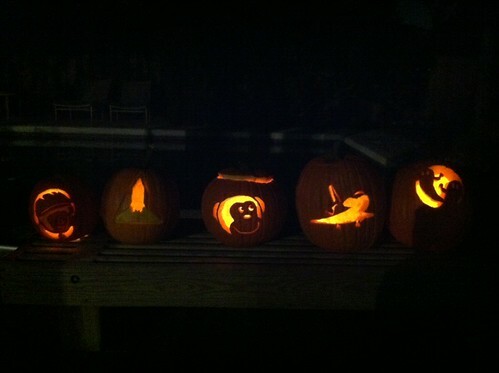 Our line up of Space-O-Lanterns: L to R Yuri GagarKin (by Rachel Hobson), Space Shuttle Tribute (by Robert Pearlman), Timmy from Think Geek (by Liz Warren), Space Shuttle landing (by Carl Carruthers), Ghosts - we like to think they are space-y ghosts! (by Sheila) Thanks to our carving cheerleader extraordinaire, Cindy, for taking pictures and live-tweeting the event! A few days later, we joked on Twitter that there should be a World-Wide Space-O-Lantern Carving Day and decided that we didn't even need to wait until next year to start it. So here we are. The First Ever World-Wide Space-O-Lantern Carving Day, October 28, 2011. What does that mean? 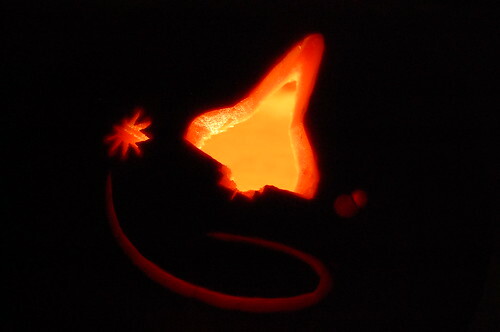 Today is a day to carve - on your own or with friends - a pumpkin with some kind of space themed image. Rockets, shuttles, planets - you name it. Anything that celebrates space exploration goes. At our Space-O-Lantern carving party, we had shuttle pumpkins, a Wernher von Braun pumpkin, a Timmy (Think Geek) pumpkin and a Yuri Gagarin pumpkin (or Gagarkin, as I liked to call him). Call your friends and set up a Space-O-Lantern carving party. Share ideas for space-y images and get carving. Share telescopes and look to the skies for even more inspiration. Live-tweet your carving parties with the hashtag #SpaceOLantern. When you've carved your Space-O-Lanterns, be sure to add them to the Space-O-Lantern Flickr group. From here on out, the last Friday before Halloween will now be known as World-Wide Space-O-Lantern Carving Day, so start planning your carving parties now! 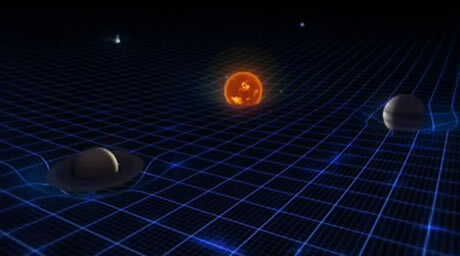 Next year, I'm totally making a Hubblekin. 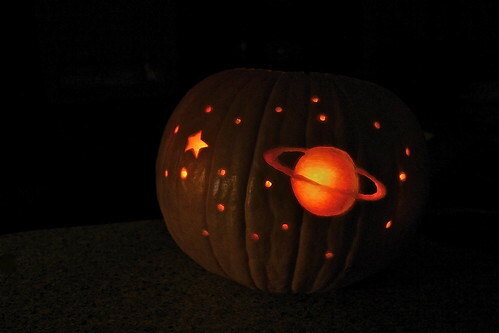 Awesome planetary Space-O-Lantern by Jen Scheer. Last week, my son had a school assignment to decorate a pumpkin as his favorite character from a book. Of course, the book he picked was a Pokemon one, and the character he chose was Pikachu. Despite both of my kids having been Pokemon fanatics for a couple of years now, I still haven't quite gotten all the lingo, characters and story lines sorted out, but I do think this yellow "electric type" is a cutie and was excited to see him transformed into a pumpkin. My son was adamant that he had to do "ALL THE WORK," and for the most part he did. Shortly after starting, we both realized that Pikachu was turning out to be pretty awesome so we decided we'd share the process here with you. 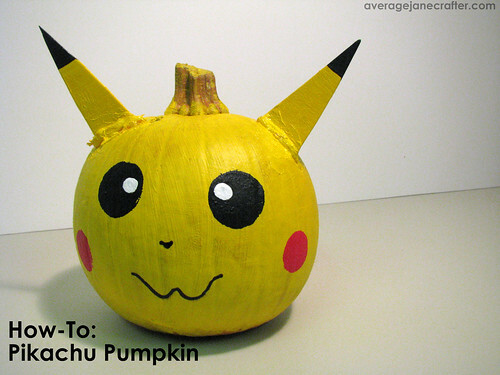 It's pretty straightforward, but hopefully you'll see how easy it is to transform a pumpkin into a Pikachu and will want to jump in before Halloween. We used a small round pumpkin, and since the kids weren't allowed to carve the designs (gooey pumpkin guts on the display in the library would be ... not so awesome) we knew paint was the perfect medium. 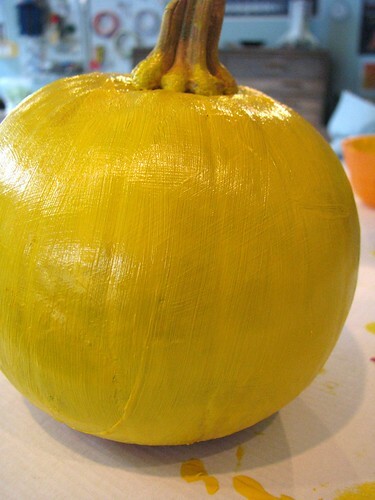 It took two or three layers of the yellow acrylic paint to really coat the pumpkin. We set up on a scrap piece of cardboard and let my son paint away. He played while each layer was drying & it didn't seem to take to long between coats. 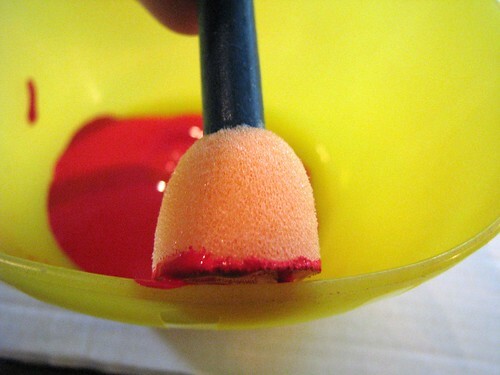 For the eyes and cheeks, we used the round sponge brushes. 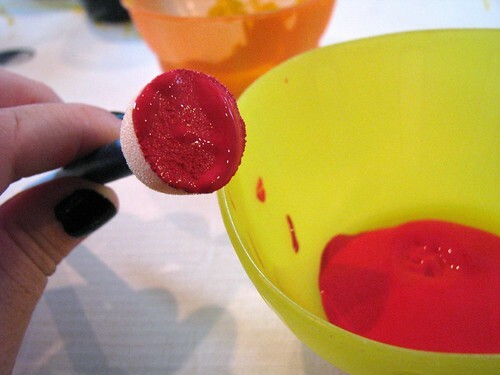 Put a small amount of paint into one of the small plastic bowls. 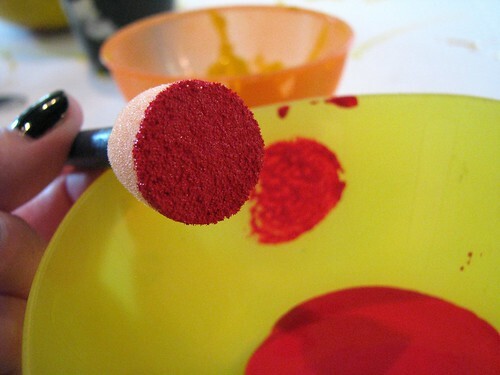 Dip the brush in the bowl, then dab it against the side of the bowl to remove the excess paint and give it a light, even coating. 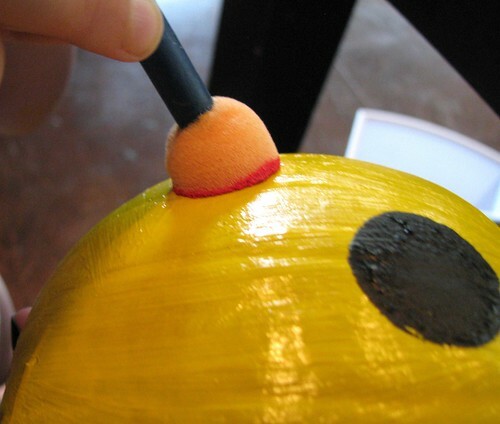 Press the sponge brush straight down on the pumpkin and gently rock it around to make sure the entire circumference of the circle gets painted. We practiced a couple of times on the cardboard to get the motion down. My son quickly picked it up and was stoked to see the perfect circles he was able to create with the circle sponge brush. 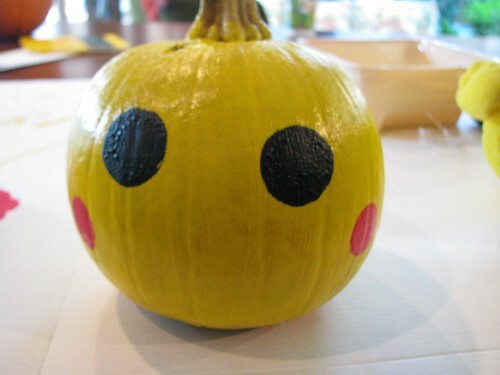 Place the eyes toward the center of the pumpkin, and the red cheeks just below and to the right and left of the eyes. I helped my son with the nose and mouth, because the lines are so fine. 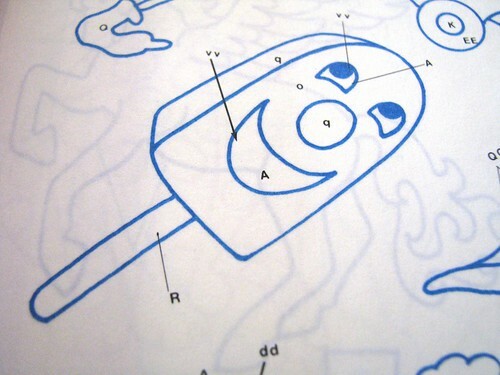 Matching the lines in your reference drawing (or stuffed animal) draw the small nose and wavy mouth. 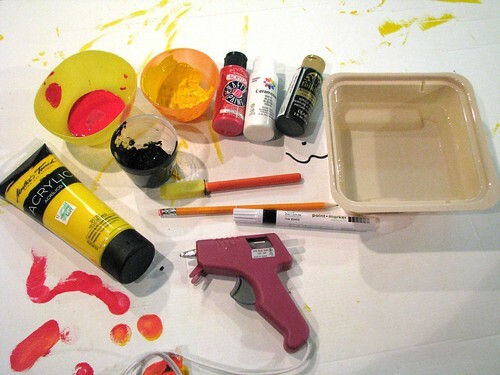 For the ears, paint a layer of yellow acrylic paint on mat board or heavy cardstock. 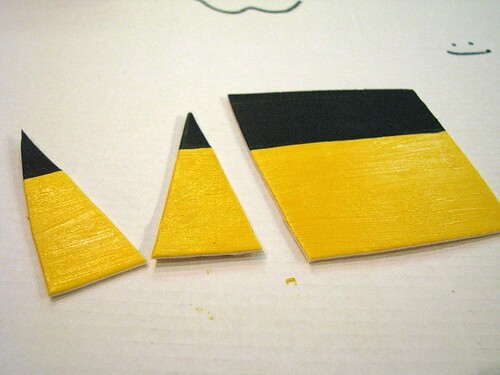 Then paint a stripe of black across the top. 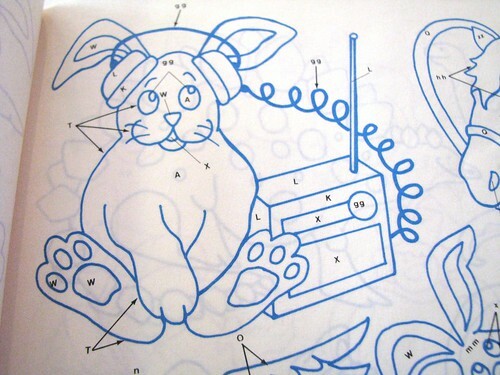 Cut the elongated triangle shapes out to create the ears. To attach the ears, hold them in place and surround each one with hot glue (this was the other time I helped my son so he wouldn't burn his fingers) Hold the ear in place while the glue dries enough to set up and support the ears. 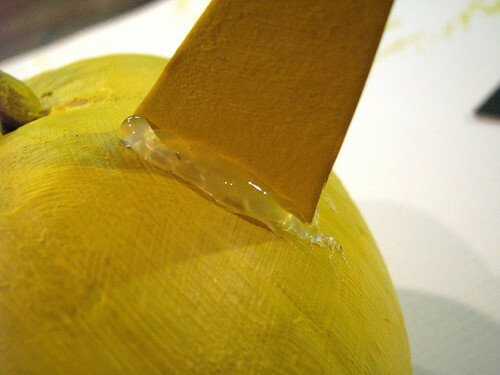 Once the glue is completely dry, paint the glue with the yellow acrylic paint to help it blend in to the pumpkin. Voila! Pikachu Pumpkin! My son was so excited to take his Pikachu Pumpkin with him to school this morning. We kept joking that he needed to carry it on his shoulder. And even though I'm not a diehard Poke-Parent, I could still deeply appreciate his enjoyment of turning a plain pumpkin into an awesome Pikachu. I've been on a bit of a cooking kick lately, which is really really strange for me. I've never been very in to cooking (baking, maaaaybe, but not even that much) and I fell even further away from cooking once I had kids. Yeah, yeah - horrible, I know. But nothing is worse than spending loads of time making a nice meal only to have the kids turn up their noses at it. What can I say? Other things were more fun and rewarding than cooking, so I just let it slide and got by as minimally as I could. And then Pinterest came along. And darn if something didn't just click for me. I guess it's all the gorgeous and easy recipes that get pinned. I started a food board and before I knew it, I was eager to make meal plans and grocery shop. Baffling, right? It's been going strong for about a month now, and I have to say it's been very nice. I've gotten in to a routine of sending the kids to the showers while I make dinner (and sometimes even listen to my own music, it's amazing!) and I've grown to enjoy that time in the kitchen. Most importantly, though, is that the kids are actually eating what I make and like it. I have no idea where this is coming from, but I'll take it. Our dinners have taken on an honest-to-goodness sit-down-and-chat-about-your-day quality at least 4-5 times a week. That's huge for us. 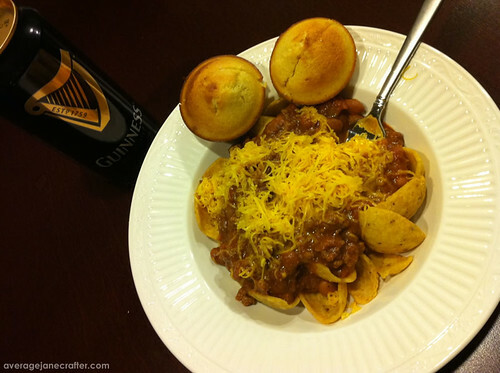 Last night, I made what might be the best chili I've ever made - or eaten - in my life. I tweeted about it and had several friends ask for the recipe. It was kind of a mash up between Pioneer Woman's Chili Frito Pie and the recipe on the back of a pack of Lawry's chili seasoning. I read several chili recipes online while I was prepping my grocery list and somehow got these two recipes mixed up. I came home with the wrong ingredients. I ended up just kind of winging it between the two of them, and it worked out in my favor. I know that's the worst picture of food ever, but I didn't realize how good this was going to be until I started serving it. I'm no Pioneer Woman. I don't have gorgeously focused pictures of the cooking process. Forgive me. But I promise, it's still worth making. Enjoy! About 15 minutes before you are ready to serve, mix the masa and warm water in a separate bowl. Add it to the chili and stir well and simmer for 10-15 additional minutes. Fill the bottom of a wide bowl with Fritos and scoop chili on top, sprinkle cheese and onions (if desired) on top of that. It's especially good with Guinness on a cold night. I made cornbread as well, because my husband loves having cornbread with chili, but the corn chips suffice. Hopefully that makes sense! I'll share links and recipes that we find and love as I can. I've been on the receiving end of some very lovely handmade gifts lately, and wanted to share a couple with you here. 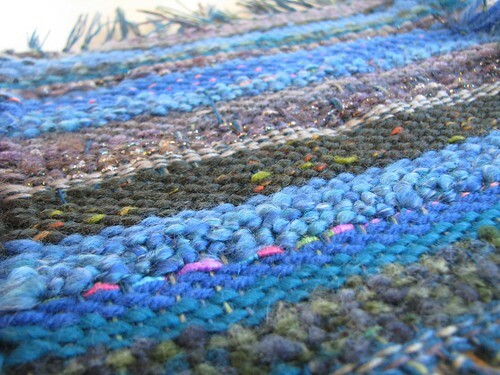 First up is this gorgeous Saori weaving from Pam of Gingerbread Snowflakes (Diane's mom). Pam and Diane have become dear friends over the last few years, and serve as a surrogate crafty family for me. I love 'em! 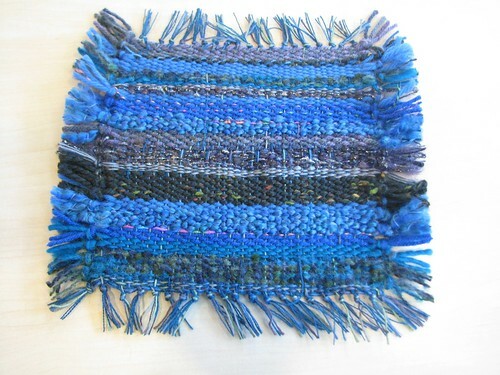 Pam and Diane have done all kinds of cool weaving projects, and I was delighted to receive this one from Pam in the mail recently. When I asked Diane if she knew your favorite color so I could make you a saori, she suggested I make one to represent the "colors" in space. I have done my best! See if you can fnd the sparkly Milky Way in a veil of clouds; deep space filled with colorful galaxies; nebulae rising into the space about the weaving and a mock spectrograph or two. It is one of the most thoughtful gifts I have ever received and got me a little misty-eyed. Thank you, Pam! Last month, I posted on CRAFT about this awesome needle felted Kermit the Frog from Rad Megan. Aside from being a gal after my own heart with the "rad" in her name (my first screen name from waaaaaaay back when - AOL when - also started with "rad") she also adores the Muppets. 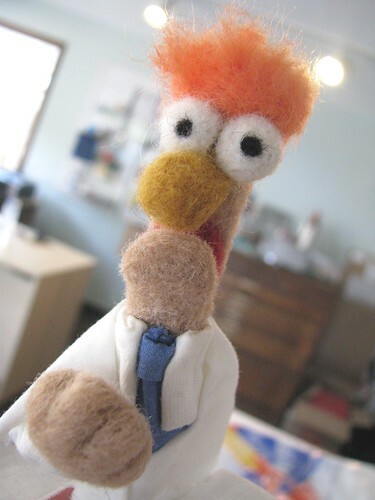 I feel in love with her Kermit and was excited when she mentioned she was working on more needle felted Muppets, including everyone's favorite frantic scientist, Beaker. The next thing I knew, Megan was asking for my address and her awesome little Beaker arrived on my doorstep! I couldn't believe it! Such a generous treat. Thank you, Megan! You are - for sure - RAD. Soon to come: the ups and downs of renovating & living in an older home, adventures in estate sales, excursions around Houston and visits from crafty BFFs. 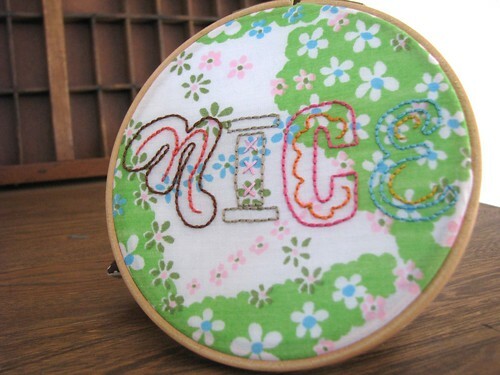 One of my favorite things to do is stitch random, fun projects for friends. There is great pleasure and satisfaction in creating something for someone for almost no reason other than you think they are awesome and you love to stitch. Here are a few things I've stitched for friends lately. Enjoy! Millie Motts was one of the fist blogs I started visiting years ago. She posts a wide variety of delicious mid-century ephemera, and I've never left her blog not feeling complete inspired or happy. She and I started corresponding a while back, and it was wonderful to see that she's as generous and kind as her posts are charming. She once posted a series of cool 40s button ads that just about left me breathless. 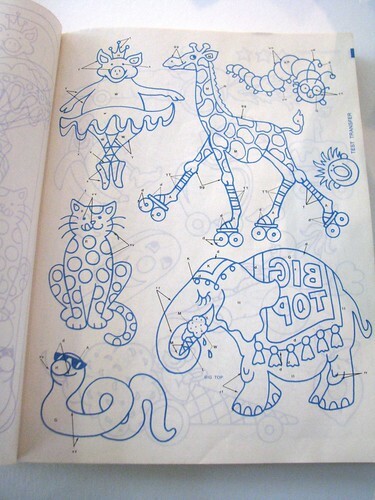 Aside from being beautiful, the graceful line drawings begged to be stitched. So I did just that. 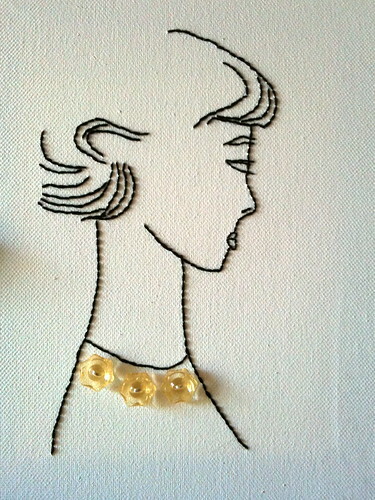 I stitched one of the profile images right on to an 8X10 canvas and attached a few darling glass buttons at the neckline. 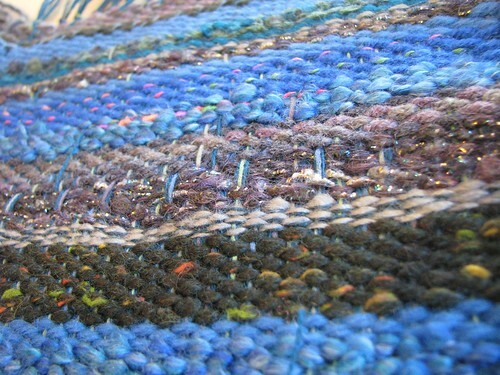 It was a super simple project that I finished in an evening watching television. The irony? Though finished in just a few hours, it took me a YEAR AND A HALF to mail it to her. I'm not kidding. I moved this piece with us to Houston and then shipped it. I have a sickness when it comes to shipping things. I am horrible *horrible* about getting to the post office. Clearly, I need to work on that. Thankfully, she didn't mind and the piece is now at home in her living room. We did a glasses switch-a-roo at Maker Faire last year. 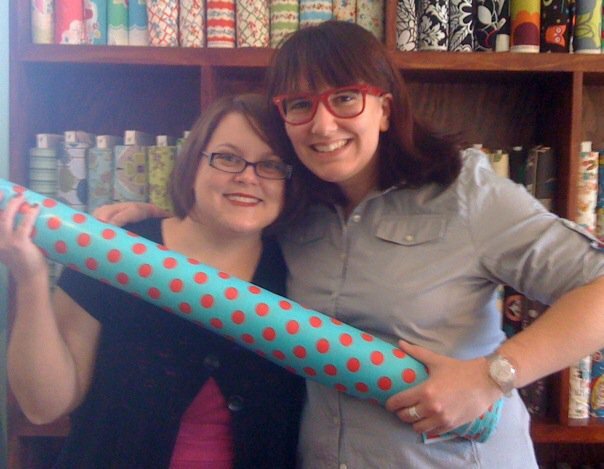 Hanging out with some rad laminated cotton fabric at the Stitch Lab in Austin. 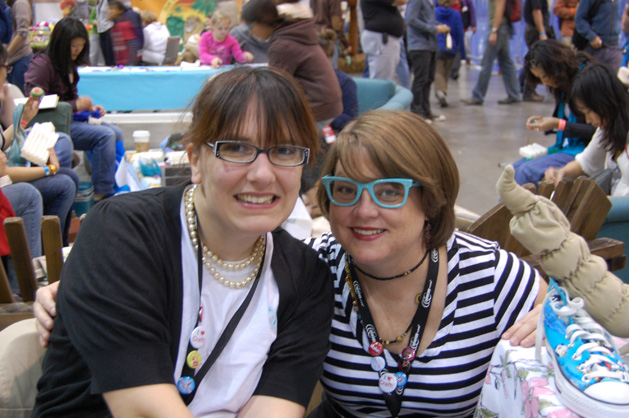 My CRAFT blogging co-hort, Lish, is one of the most awesome folks I've ever met. We hit it off instantly when we first met in person a couple of years ago when she was in Austin for SXSW, and bonded over Swatch watches, Converse and crafting. 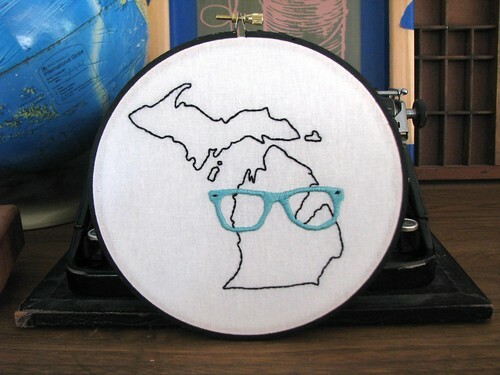 Lish's trademarks are her glasses and her undying love for her home state of Michigan. Her emails often open with "Hello from the Mitten State" and I always picture her on a map, jumping and waving over the state of Michigan. I decided to stitch a little pick-me-up present after a hard week for Lish a while back, and immediately knew what I wanted to make: a Lishigan stitchery. How better to celebrate Lish's style and enthusiasm than with a Lish-Branded Michigan map? The Upper Peninsula is included for accuracy and because Lish's beau, Nick, stressed its importance to true Michigan folks. This was also one of my first attempts with honest-to-goodness "fancy" hoop framing, just meaning that I finished the back off with felt and painted the hoop. I was happy with how it turned out! One of my former Stitch Lab pals and stitchy friends, Niku, recently moved into a new apartment. As part of her "nesting" in the new place, she asked a group of friends if we would be willing to stitch a small, simple piece to hang as part of a needlework collection in her new home. It was a perfect quick-and-easy project, made more fun by the fact it was for a friend. I went a bit willy nilly with it and just dove into my embroidery pattern stash and scraps of fabric (used more of the mumu that was first spotted on my daughter's tooth fairy pillow here) I used Sublime Stitching's rad Epic alphabet and just started picking out letters I thought looked like they would be fun to stitch. I settled on the word "nice" though later, I realized there were a million other words I could have come up with. Ah well, that's the beauty and the downfall of a quickie project - it's fun to dive right in, but you can't have regrets later over quickly-made decisions. I have an ongoing list of more projects to stitch for friends, and look forward to tackling them after I get through a big book project I'm working on this fall (no, not a book of my own - just contributing a chapter to a friend's book ;) What have you stitched up for friends lately? Tomorrow, I'll be back with some lovely things friends have made for me.